Janus v. AFSCME Council 31 is an attempt by the rich to use the Supreme Court to further rig the economic playing field against workers. 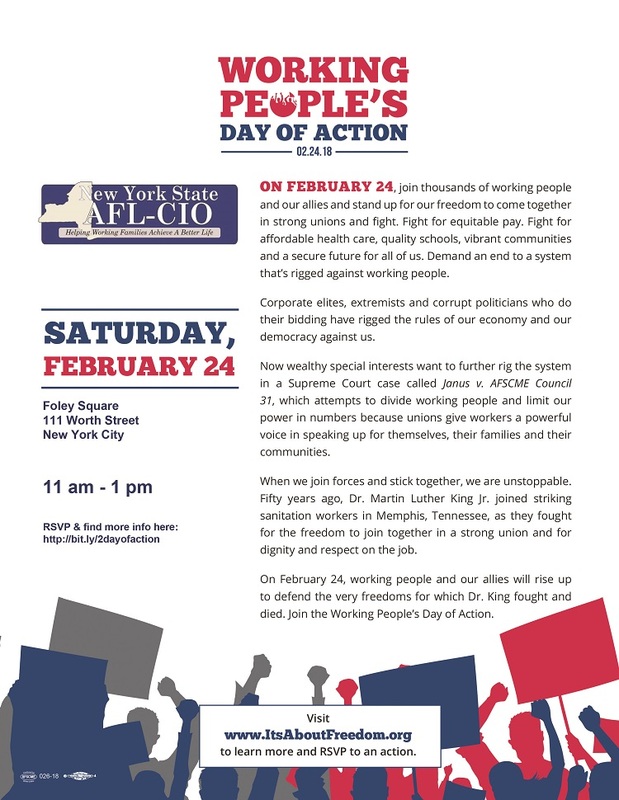 Working people know what we need to build a better life, and will keep fighting for justice. Share this to support workers’ right to join together in union. The Executive Negotiating Committee this week met face to face with American Airlines in Washington D.C. Discussions continued on the MLS Classifications Article that contains some Scope provisions. The parties continued to narrow their positions in this article. Scope discussions were completed for MTS, except for those covenants that are global in nature and will apply to the Scope article for all JCBA’s. The Negotiating Committees continued the task of building JCBA drafts with all the previously tentatively agreed to Articles, an arduous and painstaking process to ensure accuracy of the agreed upon language. With the progress made on these tasks, the Fleet Service Committee will meet with the company the week of February 26th and the M&R Committee will meet with the company the week of March 5th to reconcile any errors that either party has identified while compiling the JCBA drafts with the previously agreed to tentative agreements. During the next 2 weeks that this reconciliation process takes place, the Executive Negotiating Committee will continue dialog with American Airlines on the outstanding Scope and economic topics, healthcare, retirement and all forms of compensation in an effort to move closer to a successful conclusion of JCBA negotiations. Your continued solidarity and support continues to inspire and motivate your committees to bring these negotiations to completion. Take action on Janus!!! Your participation is a must!